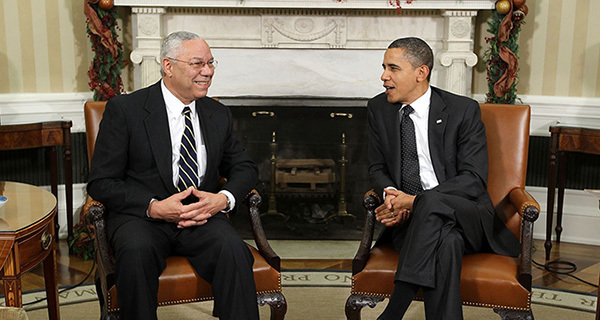 Chicago, Il – Former Secretary of State, National Security Adviser, and Chairman of the Joint Chiefs of Staff Colin Powell, publicly endorsed President Obama for re-election today, saying that he believes Mitt Romney cannot be trusted. Powell has been involved in the past three Republican administrations, serving as Ronald Reagan’s National Security Advisor, George H.W. Bush’s Chairman of the Joint Chiefs of Staff, and Secretary of State under George W. Bush. The past four years under Obama, Powell said “Generally we’ve come out of the dive and we’re starting to gain altitude.” He did acknowledged that problems still remain. Foreign Policy: Powell said he saw “The president get us out of one war, start to get us out of a second war and did not get us into any new wars”, and I think that the actions he has taken with respect to protecting us from terrorism have been very very solid. Despite the endorsement of a Democratic candidate in two presidential elections, Powell says he remains a Republican.